What an Honor! | Tired, Need Sleep. So good to hear some of these interesting things about you! Spicy food is popular in our house too! 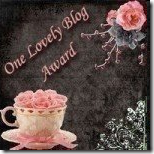 Thanks so much for sharing my blog in your awards list, I'm very pleased you are following.